Rumors have surfaced that Fisker Automotive is planning a third plug-in hybrid car to target the "premium entry level segment," essentially the Chevy Volt, whose former program lead is now the CEO of Fisker. While Fisker Automotive is unabashedly targeting the luxury market with the Fisker Karma, its plug-in hybrid luxury sedan, the company has long promised its long term goal was to build lower priced electric or plug-in hybrid cars for the masses. The now-delayed Fisker Atlantic is a step in that direction, and now rumors are surfacing of a new, even lower priced, plug-in hybrid car designed by the Fisker team. InsideEV's claims to have unearthed a presentation given to investors earlier this year describing a third EVer (a.k.a. plug-in hybrid) car built on an all-new platform, the "P Platform". 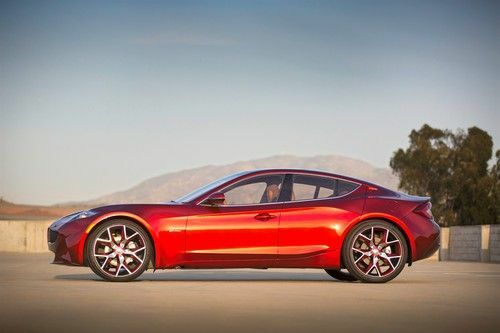 The new car would plant Fisker Automotive in another segment of the market. Its existing car, the Fisker Karma, sits in the luxury car market competing against the high end of BMW, Mercedes and Audi. The Fisker Atlantic, when it, if it ever, goes into production, will be competing against the middle-grade cars from the same automakers. This P Platform car would be targeted against General Motors in the "entry level premium segment." In other words, Fisker Automotive wants to take on the Chevy Volt. That is, if the rumors are true. Anybody can make up a rumor, and this unsourced unverified report could simply be a pie-in-the-sky rumor. But there are some attributes to Fiskers recent history that give credence that this might be Fisker's plan. Most important is the over $1 billion of private investment capital raised by Fisker, much of it this year as the company sought to replace the frozen loans from the Dept of Energy. This level of investment indicates the investment community has been shown big plans that give investors confidence that Fisker will become a big player. Similarly, recalling the story from August of a Karma whose engine caught fire in Woodside CA, the owner of that Karma is an investment banker who is bullish on Fisker, and is an investor in the company. It takes confidence to remain an investor in the company after your car catches on fire. And there is the issue of the persons who filled the CEO's chair after Henrik Fisker stepped out of that role. The company first hired Tom LaSorda, former CEO of Chrysler, saying his duties included "global business development and alliances." LaSorda arranged Fiat's buyout of Chrysler, so he certainly has experience in that arena. Six months later the company hired Tony Posawatz as CEO, while keeping LaSorda around as a mentor/advisor to Posawatz. While Posawatz has no CEO experience, he brings to the company some vitally important knowledge. As former head of GM's Chevy Volt program, he has complete knowledge of the GM's plans for the Voltec platform being used in the Chevy Volt and slated for the Cadillac ELR. What purpose does Fisker Automotive have for bringing together executives with this mix of talent? In the meantime the company is successfully selling the Karma through a growing dealer network. In June the company's dealership in Montreal opened, and in October the company announced a dealership agreement for several countries in the Middle East. The company is also winning awards for the Fisker Karma, with four prestigious design awards in October and two more in May. I heard a rumor that the sole supplier of Fiskers batteries filed for bankruptcy. It's not true, I hope. Well, at least 90% true, John. The company (A123 Systems) that has been providing batteries did file for bankruptcy and sold their automotive-business assets to Johnson Controls. It gets a little murky after that with auctions/filings etc, etc. Fisker has stated that they have other sources, so it won't impact their business - this will, at the very least ensure that they won't rely on sole-suppliers in the future.